Do you like Halloween? Do you dress up? For this week's dose of Girl Talk we're cleaning it up a bit and talking about costumes. Favs from the past? Plans for the future? So... I loved to dress up as a child. Now, not so much. I hate to say it but dressing up now sort of embarrasses me. These days my plans for Halloween revolve around my kids and what they'll be each year. Me? I wear jeans and some sort of cute girl shirt that has pumpkins on it or says "Happy Halloween" on it. (Hello Old Navy! Thank you!) This year I bought some bling to iron on my own t-shirt. I'm so original no? As a child my mom did a great job coming up with costumes for us. She made them. Painstakingly made them and at the time, they were the coolest things ever. I mean check me out here... 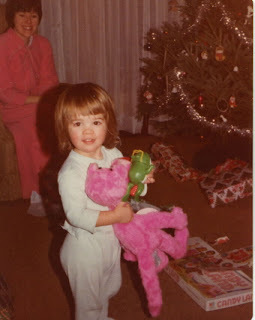 I received my favorite Pink Panter stuffed animal when I was 2 on Christmas Day. I loved that stuffed fabric so much my mother made me a Pink Panther costume when I was in Kindergarten. The best part about that? The body of the costume was a fleece pajama zip up one piece. I grew up in New York. I trick-or-treated in MOON BOOTS. Warm pajamas were awesome. Plus we got extra use out of the costume. Do I know I look ridiculous in this picture now? Yup. Am I mortified? Yup. 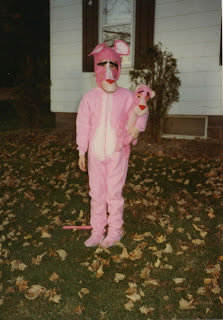 But my mom MADE that Pink Panther costume and that's wicked cool even if I'm not for showing you those photos. 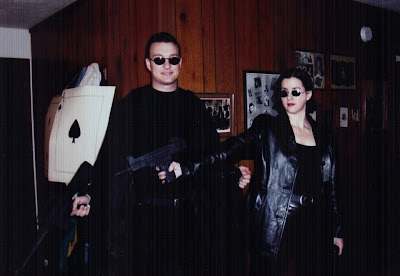 Later in life, my husband (boyfriend at the time) decided to dress up as Neo and Trinity from the Matrix for a Halloween party at our friend's house. We spent a lot of time shopping for just the right black clothing to wear. And yes, I did drop $200 on a black leather coat because I really wanted a black leather coat. Yes, hubs did buy a black trench coat. (We still own them and still wear them... 8 years later.) 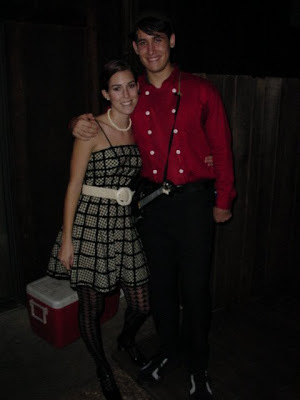 We bought a ton of water guns and spray painted them black and strapped them all over our bodies and inside his coat, etc. It was awesome and totally fun. We did laugh though getting out of my car and heading in to the party. The guns looked REAL and we were glad no cops were around canvasing for trouble. That would have been fun. Special bonus! That Halloween party was also graced by the fabulous and adorable George and Maria! After the Neo and Trinity get up we dressed up as Harry Potter and Hermione (no photos of that one, which is just fine with me) the next year and after that, hung up our creative minds and haven't dressed up since. Now my fun is dressing up my kiddos! The eyebrows on the Pink Panther costume are KILLING ME. Very cool costume though. I never got to be cool stuff when I was a kid. Just whatever we could scrounge up around the house. Those Matrix costumes are HOT. Love that you got to trick or treat in moon boots. Plus it's super impressive that your costume isn't just pink, but it really does kinda' look like the Pink Panther! Kudos to your awesome mom! That Pink Panther costume is amazing! So adorable with the stuffed animal to go along with it.